James Jesus Angleton (L), chief of the CIA’s counter-intelligence staff from 1954-1975, and Reagan-era CIA Director William Casey (R) were both members of the Knights of Malta. It seems unusual for a staid, respected publication (one that has received three National Magazine Awards in just this past decade) to start treating a celebrated journalist (who himself has won two National Magazine Awards in just this past decade) as if he were nothing more than a paranoid crank. It seems unusual, but it’s exactly what the staff of Foreign Policy has done to Seymour Hersh, following a lecture the venerated reporter gave at Georgetown University’s campus in Doha, Qatar. Hersh “delivered a rambling, conspiracy-laden diatribe here Monday,” Blake Hounshell reported on the magazine’s Passport blog. His delusional fantasia: The existence of ties between the U.S. Military’s Joint Special Operations Command and a secretive Catholic order called the Knights of Malta. Just how “off-base and conspiratorial” are Hersh’s claims? Who are the Knights of Malta, exactly, and what has been previously reported of their ‘special operations’ and government ties? 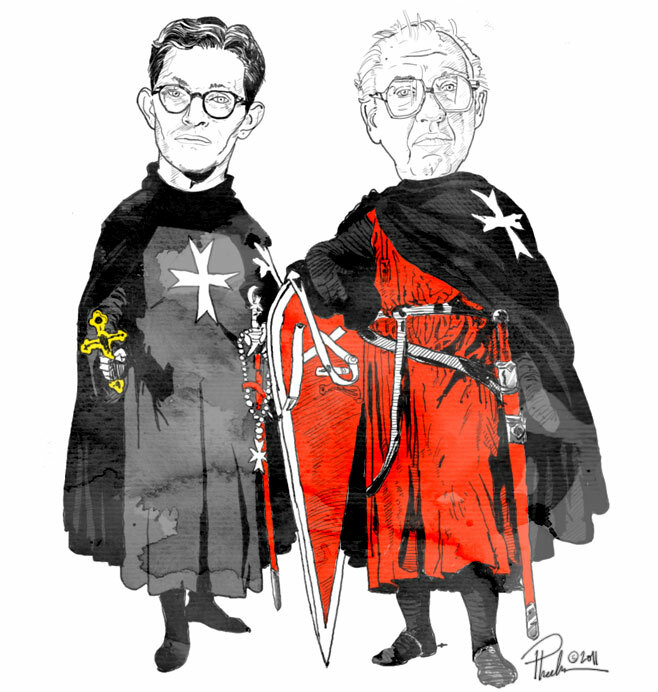 In addition to Casey and McCone, the Knights of Malta also counted among their members former CIA counterintelligence chief James Jesus Angleton—a fortuitous alliance as Angleton led the postwar intelligence efforts to subvert Italy’s 1948 elections. His success partnering with organized crime, right-leaning former fascists and the Vatican not only marginalized Italy’s homegrown Communist Party, it also encouraged Congress in the creation of the Central Intelligence Agency. Conservative luminary and National Review founder William F. Buckley—who spent two years after college as a CIA ‘political action specialist’ in Mexico City—was also a Knight, as was none other than William “Wild Bill” Donovan, the head of the CIA’s precursor organization, the Office of Strategic Services (OSS). From 1970 to 1981, France’s intelligence agency was also headed by a member of the Order, Alexandre de Marenches. De Marenches would go on to be a co-founder of the Saudi-funded private intelligence group the Safari Club—one of George H. W. Bush’s many end-runs around congressional oversight of the American intelligence establishment and the locus of many of the worst features of the mammoth BCCI scandal. With “medical missions in more than 120 countries,” as Keating points out, a teeming network of government spooks operating under the diplomatic protection afforded the Knights of Malta would certainly have plenty of breathing room to operate unnoticed. And yet, Keating instead positions the Order’s charitable work as evidence that the Knights have left their old military function behind—pointedly ignoring years of charitable work tied to U.S. strategic goals and covert activities during the heady days of the Reagan/Bush era. Beginning in 1982, The Knights of Malta began an intensely collaborative partnership with the international aid organization AmeriCares—a charity group unique in its selective disaster relief to countries friendly to both U.S. business investment and foreign policy objectives. Literally billing itself as “The humanitarian arm of corporate America,” AmeriCares was founded and headed until 2002 by Robert Macauley: a college roommate of George H. W. Bush, a paper mill millionaire and a self-described (then self-denied) agent in the CIA’s WWII-era precursor, the OSS. Macauley was also the first non-Catholic to receive the coveted Cross of the Commander of the Order of Malta. AmeriCares and the Order held off on relief to an economically crippled Panama in 1989 for six whole months, shuttling $2.5 million worth of medical supplies only after the conclusion of Bush Sr.’s lightning war against (former ally) Manuel Noriega. In Guatemala, AmeriCares and Knights of Malta joint activities were handled by the wealthy, right-wing paramilitary figure, Roberto Alejos Arzu, whose plantation had served as a training ground for the CIA’s bungled “Bay of Pigs” invasion of Cuba. Seymour Hersh is in the middle of researching and writing a lengthy book on America’s wars and occupations in Iraq and Afghanistan. He has something of a history of playing looser with his facts in speeches than in print—partially to preserve his scoops pre-publication—and his speech in Doha hewed close to that tradition. In addition to the Knights, for example, he also made claims regarding Opus Dei, another secretive far right Catholic group steeped in just as much rumor and conspiracy theory. However, Hersh is a five-time Polk winner and recipient of the 2004 George Orwell Award—a reporter with a record that is well-burnished and nearly sterling. Given the late 20th Century history of the “Sovereign Military Hospitaller Order of Saint John of Jerusalem of Rhodes and of Malta,” how strange would it really be to find members of the Order, in and out of the military, collaborating on a new silent crusade with their old Cold War allies? This time around, they’ve practically goaded us into it. This entry was posted in Big Government, Black Ops & Dirty Tricks, Christianity, Communism, Cover-ups, Crime & Corruption, Fascism, Food Psyops, Illuminati Elites, Intelligence Agencies, Islam, Medical Mafia, Mercenaries, Militarization, Military Industrial Complex, Perpetual War, Politiks As Usual, Psychopathy, Religion & Spirituality, Secret Societies, Social Engineering, Technocrats, Theocracy, Treason, Vatican. Bookmark the permalink.